SUBJECT :Official team visits Haryana to study the conservation methods. A Vulture and its Juvenile on the Palarapu habitat in Kumram Bheem Asifabad. Hyderabad, May 16, 2018: The Long-billed vulture or Indian vulture (gyps indicus) is critically endangered. 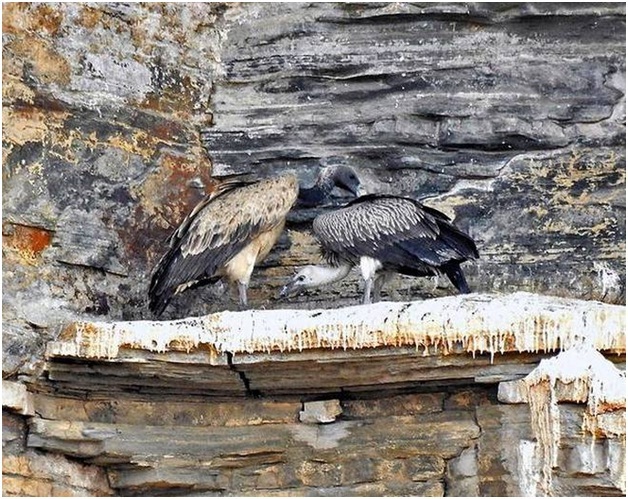 According to conservationists, the way to conserve its present population and increase it is to step up conservation efforts at the Palarapu cliff vulture habitat in Kumram Bheem Asifabad. A team of Forest Department officials connected with conservation of vultures at Palarapu habitat — the only one in Telangana State — recently visited the Jatayu Conservation Breeding Centre (JCBC), Pinjore, Haryana, to study the methods and status of conservation. According to them, the Vulture Safe Zone (VSZ) initiative of the Pinjore JCBC needs to be implemented in Telangana too to make it safer for the scavenger birds here. The JCBC has launched the initiative to protect three species of vultures including the Long-billed vulture, but its efforts are concentrated in North Indian States only. The team, led by Kagaznagar Forest Divisional Officer A. Narasimha Reddy, will submit its report to the authorities soon which will discuss the VSZ. The Principal Chief Conservator of Forests P.K. Jha, who was informally told about the VSZ during his visit to Kuntala Waterfall last week evinced keen interest. “The project envisages elimination of the probability of consumption of the drug Diclofenac through animal carcasses by the vultures within a radius of 100 km which is considered to be the range of the habitat. It requires a massive effort in monitoring the use of the drug which is among the main causes for disappearance of the great fliers,” revealed M. Ram Mohan Rao, the Forest Range Officer at Bejjur Range in Kumram Bheem Asifabad. The VSZ will need the cooperation of Forest, Food and Drug Administration and Animal Husbandry departments to control the supply of Diclofenac. As the zone will encompass 32,000 sq km in Telangana, Maharashtra and Chattisgarh, the involvement of the governments of these States is also essential. “The initiative involves massive awareness on the issue of Diclofenac not only among people but other stakeholders like the government departments,” observed M. Ravikanth, the field researcher at the vulture conservation site, now in Penchikalpet Forest Range. “The effort in establishment of VSZ will also benefit vulture habitats in Maharashtra and Chattisgarh,” Mr. Ram Mohan Rao opined. Copyright (c)2011 by Ministry of Environment & Forests, Govt. of India, All rights reserved.